School Monitors 1873. There is no uniform, but the King’s Scholars wear gowns. King’s Scholars have always worn white surplices for cathedral services: there is a reference in 1635 to “a snowy Croud of Kings Schollers”. It seems that purple gowns were part of the uniform in the 16th century. These were replaced by black gowns in the 19th century, but purple was reintroduced in the 1930s for School monitors and Senior King’s Scholars. There was no school uniform as such until the later nineteenth century. 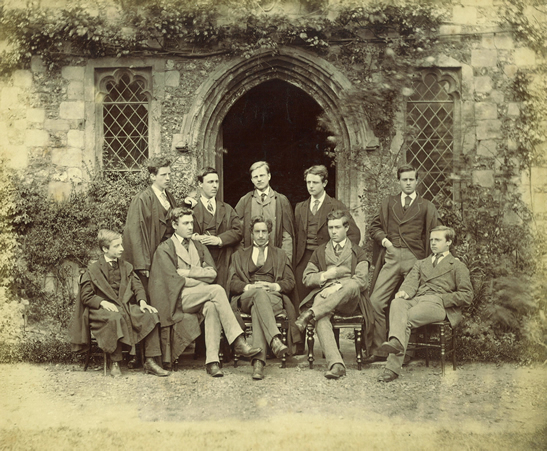 In 1887 Headmaster Thomas Field decreed that boarders were forbidden to appear on Sundays wearing other than tall hats; the elder boys were to wear tailed coats and the younger ones Eton jackets and all members of the School were henceforth to wear straw hats on week days. The current school uniform – known as ‘Canterbury dress’ – dates back just over a hundred years. The wing collar, black jacket and pin stripe trousers are very much Edwardian. (The girls’ uniform, introduced when the School went fully co-educational in 1990, is an adaptation of this.) In the mid-twentieth century there were elaborate customs relating to such matters as buttons and the angle at which a boater was worn.